Inflammation - a complex reaction to a variety of stimuli (mechanical, physical, chemical, biological and other), growing in the restricted area and consists of damage cellular elements (alteration), blood circulation disorders and permeability of vessels. When inflammation of the transition occurs in the tissue of the blood protein liquid and formed elements of blood (exudation) and reproduction of cells (proliferation). Alteration is not always a direct result of the damaging action causes inflammation of the agent. Often damage the cellular elements arise under the influence of enzymes released during the destruction of the special structures of the cell - type. These enzymes cause the breakdown of proteins, nucleic acids and other compounds. At the beginning of the acute inflammation occurs arterial hyperemia, causing redness and temperature increase in the area of inflammation, which is replaced venous hyperemia and stagnation of blood. The increase vascular permeability develops acute sore immediately after exposure to the stimulus, and is the leading cause of exudation and the development of inflammatory edema causing swelling of the tissue. Exudation contribute to the increase of pressure in the vessels as a result of stagnation, the accumulation in the tissues of the decay products and the broken metabolism. Fluid retention in the tissues also contributes to the violation of the lymph drainage, developing inflammation. Released into the fabric of leukocytes perform phagocytic function. Accumulation in the lesion products disturbed metabolism leads to disorders, increase of osmotic pressure, due to which there is such a sign of inflammation, as pain. In the mechanism of occurrence of initial disturbances of blood circulation and vascular permeability along with the direct action of inflammatory stimuli on vessels involved generated or released in the damaged tissues of biologically active substances (gistamina, kinini and others). In inflammation multiplication of cellular elements (proliferation) and there are numerous cells, as well as leukocytes performing phagocytic function. Thus, inflammation is a local manifestation of the reactions of the whole organism, as these processes are carried out thanks to the common reactions of the body, adjustable nervous and endocrine mechanisms. The important place in inflammation belongs hypophysial-adrenal system. Some hormones crust napochechnikov - corticosteroids (eg, hydrocortisone) - anti-inflammatory action, others mineralocorticoids (aldosterone) - "Pro-inflammatory", i.e. stimulate the reaction of inflammation. Based on this use in the treatment of inflammation of many drugs, derived glucocorticoid hormones,- cortisone, prednisone , etc. and ACTH, stimulates their separation. Has importance for the development of inflammation phenomena and deficiency of insulin (furunculosis with diabetes) and other hormones. The most characteristic clinical signs of acute inflammation are: redness, swelling, fever sore area (heat), pain and impaired function. However, only in acute inflammation of the surface tissues can be observed all these signs. In some forms of inflammation (alterative, productive - see below), these symptoms are absent or can be expressed only part of them. When inflammation is observed characteristic changes not only in the lesion, but also in the whole organism, for example, leukocytosis, acceleration ROHE, increased body temperature, etc., the Degree of General reaction depends on the cause inflammation (more expressed in infectious inflammation, less - in aseptic), sizes of inflammation. The condition of the body has a significant impact on the character of both General and local reactions inflammation. If infection develops on the background of increased sensitivity to the body (sensitization), it receives rapid character even under the influence of weak stimuli. This inflammation is called allergic, or giperergicakie (see Allergies), in contrast normalizacao, developing on the background of normal sensitivity of the organism. There are (with certain conventionality) the following forms of inflammation: alterative, exudative and proliferative, or productive. Alterative called inflammation, which is most pronounced phenomenon of tissue damage. 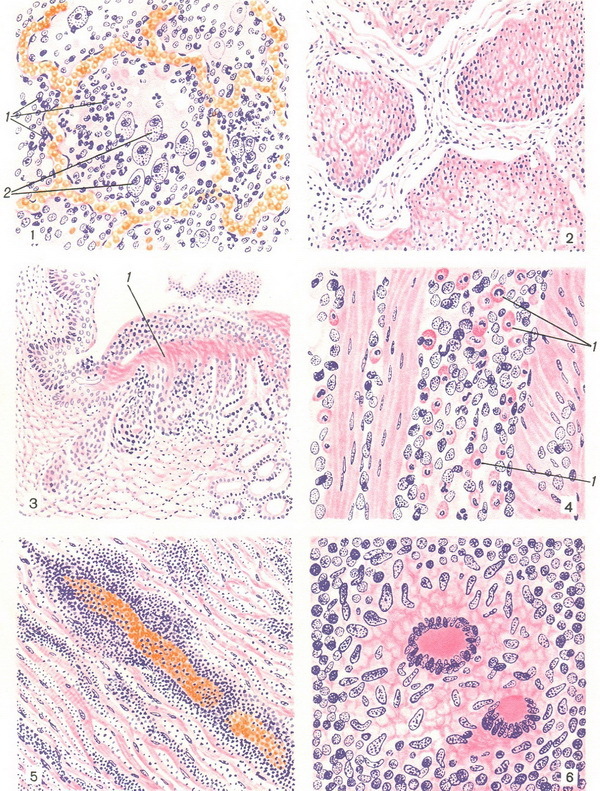 They are different dystrophic, necrotic processes (see Degeneration of cells and tissues). This inflammation is called sometimes the lung, since the main processes are developing in the parenchyma of the body (for example, liver cells, in the fibers of the heart muscle, and so on). The most severe form alterative inflammation is necrotizing inflammation, the main manifestation of which is the necrosis (death) of tissue. An example of this inflammation is a gas gangrene (see Anaerobic infection). In exudative inflammation at the forefront are the phenomena exudation - rich seepage liquid part of blood with dissolved proteins and the transition into the fabric formed elements (leukocytes, erythrocytes). Depending on the composition of the resulting inflammatory exudate distinguish the following types of exudative inflammation. Serous inflammation - exudate consists of serous fluid (i.e. liquid part of blood with dissolved proteins), which suspended in a small amount of leukocytes, erythrocytes, desquamated cells surrounding tissue. The mixture of cells gives serous exudate muddy appearance. The content of whey proteins in serous exudates usually 5-6 g%, but can be more. Serous inflammation usually develops in serous and mucous membranes. Exudate or accumulated in closed cavities, for example in the cavity of the pleura with pleural effusion, cardiac bag when pericarditis, or is released and flows over the surface of the mucous membrane (for example, bronchi). When serous inflammation of parenchymatous organs of serous exudate permeates the interstitial tissue of the body (for example, heart muscle, liver and other). Fibrinous inflammation - in takes a lot of fibrinogen. On the outside of the vessel is curtailed and turns into fibrin; on the surface serous or mucous membranes is formed fibrinous film. The latter gives a smoother serous surface dull, dull appearance, and at the big thickness of the film - villous (for example, "hairy" heart when fibrinous the pericarditis). Fibrinous film can loose on the mucosal surface (or serous) shell easily removed - lobar inflammation. In other cases, when fibrinous inflammation is combined with a deep tissue necrosis, films are tightly with the sea surface and hardly separated from her fibrinous-necrotic, or diferitele, inflammation. (This kind of fibrinous inflammation should not be confused with diphtheria - the name of the disease caused by diphtheria Bacillus Leffler, which along with other phenomena observed and this inflammation of the mucous membranes.) Fibrinous exudate can dissolve, to sprout connective tissue or rejected together with nekrotizirovanne fabrics. When fibrinous inflammation is a fusion of contacting surfaces serous coverings (for example, visceral and parietal pleura), and during germination of fibrin connective tissue is dense scar connection (see the Spikes). Purulent inflammation of the exudate consists mainly of white blood cells, a significant portion of which is in a state of collapse. The white cells contain a variety of proteolytic enzymes, capable to cause melting of tissue proteins. Therefore, when a cluster of cells in the tissues suppuration, i.e. fusion of the fabric. If suppuration distributed without clear boundaries in the interior of the body, inflammation is called an abscess (see). Limited ulcer called an abscess. An accumulation of pus in any anatomical cavity (pleural, gallbladder) called empyema (see). In the case of impurities of a large number of erythrocytes exudate takes bloody nature. In such cases they say about hemorrhagic pneumonia (influenza, plague pneumonia and other). A variant of exudative is also catarrhal inflammation. In this form of inflammation affecting the mucous membranes (respiratory, digestive tract, and others), the exudate (serous and purulent etc) is allocated to the mucosal surface, and in some cases expelled. To the exudate may to a greater or lesser amount of mucus secreted by mucous glands, so that it becomes a tough nature. From catarrhal inflammation should be distinguished similar Qatar mucosa, resulting enhanced secretion glands mucous membrane under the influence of any acute or prolonged irritation and not accompanied by inflammation. Productive called inflammation, which at the forefront are the phenomena of multiplication of cells at the site of inflammation. This is usually the cells of the connective tissue, a variety of histiocytes, members of granulation tissue. Due productive inflammation is formed connective scar tissue, which leads to wrinkling and disfigurement of the affected area. So there inflammatory cirrhosis (see) or sclerosis of the authorities. Inflammation, leading to the development of cirrhosis, called cirrhotic. Sometimes when productive inflammation cells granulation tissue are in the form of restricted sites of different size - granulomas. Often the cellular structure and the outcome of the node are specific to the causative agent (tuberculosis, syphilis, rheumatism, leprosy, of actinomycetes, typhus, typhoid, malaria); in these cases, talk about specific productive inflammation. Inflammation can occur acutely or take a chronic course, regardless of its form or variety. The outcomes of inflammation depends on the pathogen, the nature of the inflammation, the extent and volume of the damaged tissue and from the reactivity of the organism. Exudate can completely disappear or to sprout connective tissue. When the loss of tissue defect is replaced first young connection, and then scar tissue (see Regeneration). The healing of connective tissue should be distinguished from productive inflammation, where the tumor tissue form of inflammatory reaction in which this fabric is subject to decay, and then comes the healing educated defect. Inflammation is adaptive reaction of an organism, which in most cases plays an important role in the removal and destruction caused damage factors - germs, chemicals and so on, as well as to distinguish and rejection of damaged these factors dead tissue. Like other adaptive reactions of the organism inflammation has only a relative sense. Too intense or prolonged inflammation and inflammation, localized in organs of vital importance, can disrupt the functions of organs and systems and to acquire dangerous for health value. Therefore directed the treatment of inflammatory process, along with the elimination of the factors that caused the inflammation plays an important role in the treatment of diseases. Fig. 1. Serous catarrhal pneumonia. Sharp hyperemia light, in the lumen of the alveoli - serous fluid with a weighted in her leukocytes (1) and desquamated alveolocyte (2). Fig. 2. Fibrinous (lobar) inflammation of the lung. Fig. 3. Diferitele inflammation of the soft palate. Ulcer surface covered with fibrinous flight (1). Fig. 4. Flegmonas inflammation of the gallbladder, it takes a lot of eosinophils (1). Fig. 5. Acute interstitial myocarditis. Round-cell infiltration between muscle fibers; accumulation around the damaged vessels. Fig. 6. Microscopic structure miliary tuberculosis granuloma.